Joseph Hilaire Pierre René Belloc (July 27, 1870 – July 16, 1953) was a French-born writer who became a naturalized British subject in 1902. He was one of the most prolific writers in England during the early twentieth century. He was a fierce proponent of Roman Catholicism, the "faith of Europe." Based on Christian principles he also championed distributivism, a "third-way" socio-economic theory that rejected the ownership of the means of production both by the state (socialism) and large corporations (corporate capitalism) in favor of a society of small entrepreneurs. Belloc was born in La Celle-Saint-Cloud France (next to Versailles and near Paris) to a French father and English mother, but grew up in England. His mother Elizabeth Rayner Parkes (1829-1925) was also a writer, and a great-granddaughter of the English chemist Joseph Priestley. She married attorney Louis Belloc in 1867. In 1872, five years after they wed, Louis died, but not before he was wiped out financially in a stock market crash. The young widow brought her son Hilaire, along with his sister, Marie, back to England where he remained, except for his voluntary enlistment as a young man in the French artillery. He was educated at John Henry Cardinal Newman's Oratory School and later served his term of military service, as a French citizen, with an artillery regiment near Toul in 1891. He was powerfully built, with great stamina, and walked extensively in Britain and Europe. While courting his future wife Elodie, whom he first met in 1890, the impecunious Belloc walked a good part of the way from the midwest of the United States to her home in northern California, paying for lodging at remote farm houses and ranches by sketching the owners and reciting poetry. He was the brother of the novelist Marie Adelaide Belloc Lowndes. In 1896, he married Elodie Hogan, an American. They had five children before her 1914 death from influenza. His son Louis was killed in World War I. He suffered a stroke in 1941, and never recovered from its effects. He lived quietly at home in Guildford, England, until his death on July 16, 1953. At his funeral Mass, homilist Monsignor Ronald Knox observed, "No man of his time fought so hard for the good things." 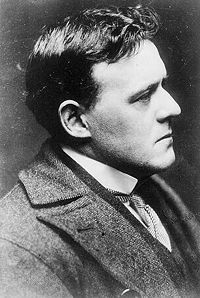 A 1895 graduate of Balliol College, Oxford, Belloc was a noted figure within the University, having served as President of the Oxford Union, the undergraduate debating society. He later became a naturalized British citizen and went into politics. From 1906 to 1910 he was a Liberal Party Member of Parliament for Salford South, but swiftly became disillusioned with party politics. During one campaign speech he was asked by a heckler if he was a "papist." Retrieving his rosary from his pocket he responded, "Sir, so far as possible I hear Mass each day and I go to my knees and tell these beads each night. If that offends you, then I pray God may spare me the indignity of representing you in Parliament." The crowd cheered and Belloc won the election. His style during later life complemented the nickname he received in childhood, "Old Thunder." Belloc's friend, Lord Sheffield, described his provocative personality in a preface to The Cruise of the Nona. It should be noted that the other characters regard the verse as fairly gauche and ill-conceived, so while part of Belloc may have agreed with this somewhat offensive song, it is not necessarily representative of Belloc's personality as a whole. He was at his most effective in the 1920s, on the attack against H. G. Wells's Outline of History, in which he criticized Wells' secular bias and his belief in evolution by means of natural selection, a theory that Belloc asserted had been completely discredited. Wells remarked that "Debating Mr. Belloc is like arguing with a hailstorm." Belloc's review of Outline of History famously observed that Wells' book was a powerful and well-written volume, "up until the appearance of Man, that is, somewhere around page seven." Wells responded with a small book, Mr. Belloc Objects. Not to be outdone, Belloc followed with, "Mr. Belloc Still Objects." Belloc was one of the Big Four of Edwardian Letters along with H.G. Wells, George Bernard Shaw, and G.K. Chesterton, men who engaged in controversy and debate with one another for a generation or more. For Belloc, the great question to be answered by every thinking man or woman is precisely, "What do you make of the Faith?" The answers that he and others gave to this question explain the battles he fought. Belloc wrote on myriad subjects, from warfare to poetry and many topics current in his day. He was closely associated with G. K. Chesterton; George Bernard Shaw coined the term Chesterbelloc for their partnership. His only period of steady employment was from 1914 to 1920 as editor of Land and Water, a journal devoted to the progress of the war. Otherwise he lived by his pen, and often felt short of money. Asked once why he wrote so much, he responded, "Because my children are howling for pearls and caviar." Belloc observed that "The first job of letters is to get a canon," that is, to identify those works which a writer looks upon as exemplary of the best of prose and verse. For his own prose style, he claimed to aspire to be as clear and concise as "Mary had a little lamb." His best travel writing has secured a permanent following. The Path to Rome (1902), an account of a walking pilgrimage he made from central France across the Alps and down to Rome, has remained continuously in print. More than a mere travelogue, The Path to Rome contains descriptions of the people and places he encountered, his drawings in pencil and in ink of the route, humor, poesy, and the reflections of a large mind turned to the events of his time as he marches along his solitary way. At every turn, Belloc shows himself to be profoundly in love with Europe and with the Faith that he claims has produced it. As an essayist he was one of a small, admired and dominant group (with Chesterton, E. V. Lucas and Robert Lynd) of popular writers, although he sometimes came across as too opinionated, and too dedicated a Catholic controversialist. There is a passage in The Cruise of the Nona in which Belloc, sitting alone at the helm of his boat under the stars, shows profoundly his mind in the matter of Catholicism and mankind; he writes of "That golden Light cast over the earth by the beating of the Wings of the Faith." His "cautionary tales," humorous poems with an implausible moral, beautifully illustrated by Lord Basil Blackwood and later by Edward Gorey, are the most widely known of his writings. Supposedly for children, they are, like Lewis Carroll's works, more to adult and satirical tastes: Henry King, Who chewed bits of string and was early cut off in dreadful agonies. A similar poem tells the story of Rebecca, who slammed doors for fun and perished miserably. Of more weight are Belloc's Sonnets and Verses, a much admired volume that deploys the same singing and rhyming techniques of his children's verses. Often religious, often romantic, and ever unique is Belloc's poetry; throughout The Path to Rome he bursts into spontaneous song, and snaps at the idea that he is falling into doggerel with his typical tongue-in-cheek aversion to intellectual pretension. Three of his best known non-fiction works are The Servile State (1912), Europe and Faith (1920) and The Jews (1922). From an early age Belloc knew Henry Edward Cardinal Manning, who was responsible for the conversion of his mother to Roman Catholicism. Manning's involvement in the 1889 London Dock Strike made a major impression on Belloc and his view of politics, according to biographer Robert Speaight. Belloc described this retrospectively in The Cruise of the Nona (1925); he became a trenchant critic both of unbridled capitalism, and of many aspects of socialism. With others (G. K. Chesterton, Cecil Chesterton, Arthur Penty) Belloc had envisioned the socioeconomic system of distributism. In The Servile State, written after his party-political career had come to end, and other works, he criticized the modern economic order and parliamentary system, advocating distributism in opposition to both capitalism and socialism. Belloc made the historical argument that distributism was not a fresh perspective or program of economics but rather a proposed return to the economics that prevailed in Europe for the thousand years when it was Catholic. Distributism, also known as distributionism and distributivism, is a third-way economic philosophy formulated by such Roman Catholic thinkers as Chesterton and Belloc to apply the principles of social justice articulated by the Roman Catholic Church, especially in Pope Leo XIII's encyclical Rerum Novarum and more expansively explained by Pope Pius XI's encyclical Quadragesimo Anno (On the Reconstruction of the Social Order) According to distributism, the ownership of the means of production should be spread as widely as possible among the general populace, rather than being centralized under the control of a few state bureaucrats (some forms of socialism) or wealthy private individuals (capitalism). A summary of distributism is found in Chesterton's statement: "Too much capitalism does not mean too many capitalists, but too few capitalists." Essentially, distributism distinguishes itself by its distribution of property. Distributism holds that, while socialism allows no individuals to own productive property (it all being under state, community, or workers' control), and capitalism allows only a few to own it, distributism itself seeks to ensure that most people will become owners of productive property. As Belloc stated, the distributive state (that is, the state which has implemented distributism) contains "an agglomeration of families of varying wealth, but by far the greater number of owners of the means of production." This broader distribution does not extend to all property, but only to productive property; that is, that property which produces wealth, namely, the things needed for man to survive, including land, tools, etc. Under such a system, most people would be able to earn a living without having to rely on the use of the property of others to do so. Examples of people earning a living in this way would be farmers who own their own land and related machinery, plumbers who own their own tools, software developers who own their own computer, etc. The "co-operative" approach advances beyond this perspective to recognize that such property and equipment may be "co-owned" by local communities larger than a family, e.g. partners in a business. Distributism sees the trinitarian human family of one male, one female, and their children as the central and primary social unit of human ordering and the principal unit of a functioning distributist society and civilization. This unit is also the basis of a multi-generational extended family, which is embedded in socially as well as genetically inter-related communities, nations, etc., and ultimately in the whole human family past, present and future. The economic system of a society should therefore be focused primarily on the flourishing of the family unit, but not in isolation: at the appropriate level of family context, as is intended in the principle of subsidiarity. Distributism reflects this doctrine most evidently by promoting the family, rather than the individual, as the basic type of owner; that is, distributism seeks to ensure that most families, rather than most individuals, will be owners of productive property. The family is, then, vitally important to the very core of distributist thought. With these linked themes in the background, he wrote a long series of contentious biographies of historical figures, including Oliver Cromwell, James II, and Napoleon Bonaparte. They show him as an ardent proponent of orthodox Catholicism and a critic of many elements of the modern world. One of Belloc's most famous statements was "the faith is Europe and Europe is the faith"; this sums up his strongly-held, orthodox Roman Catholic views, and the cultural conclusions he drew from them. Those views were expressed at length in many of his works from the period 1920-1940. These are still cited as exemplary of Catholic apologetics. They have also been criticized, for instance by comparison with the work of Christopher Dawson during the same period. As a young man, Belloc lost his faith. Then came a spiritual event which he never discussed publicly, and which returned him to and confirmed him in his Catholicism for the remainder of his life. Belloc alludes to this return to the faith in a passage in The Cruise of the Nona. Belloc's 1937 book The Crusades: the World's Debate made no pretense at impartiality. Despite addressing events that were more than eight centuries old, it took a highly partisan stance. In his view, had the Crusaders captured Damascus, the Islamic World would have been cut in two and "bled to death of the wound"– an outcome which Belloc explicitly stated would have been highly desirable. Since the Crusaders missed that chance, Islam survived and eventually overwhelmed the Crusader bridgehead in the Middle East. For Belloc this was not a matter of old history: Islam continued to pose a dangerous present and future threat. At the time of his writing, the Islamic world was still largely under the rule of the European colonial powers and the threat to Britain was from Fascism and Nazism. Belloc, however, considered that Islam was permanently intent on destroying the Church, as well as the West, which Christendom had built. In The Great Heresies (1938) Belloc grouped the Protestant Reformation together with Islam as one of the major heresies threatening the "Church Universal." He compared many of the beliefs and theological principles which Islam shares with Catholicism–yet despite these similarities, or rather because of them, Belloc's views it as a heresy. It is in its view of Jesus that Islam decisively diverges from Catholicism (and Christianity in general), in the "denial of the Incarnation and all the sacramental life of the Church that followed from it." Islam regards Jesus as a human being, though honoring him as a Prophet. In The Cruise of the Nona, Belloc reflected equivocally on the Dreyfus Affair after 30 years. For this reason among others, Belloc has been charged with anti-Semitism, and the issue of his attitude to Jews is still raised. For example, Norman Rose's book The Cliveden Set (2000) poses the question of whether Nancy Astor, a friend of Belloc's in the 1930s until they broke over religious matters, was influenced by him against Jews in general. He was repeatedly critical, from his days in politics onwards, of the influence some Jewish people had on society and the world of finance. "In my opinion it is a lunatic book. She is one of those people who have got one cause on the brain. It is the good old 'Jewish revolutionary' bogey. But there is a type of unstable mind which cannot rest without morbid imaginings, and the conception of a single cause simplifies thought. With this good woman it is the Jews, with some people it is the Jesuits, with others Freemasons and so on. The world is more complex than that." Speaight also points out that when faced with anti-Semitism in practice—as at elitist country clubs in America before World War II—he voiced his disapproval. Belloc condemned Nazi anti-Semitism in The Catholic and the War (1940). Dennis Barton has defended Belloc at length. He notes that Belloc condemned wild accusations against the Jews, in his own book, The Jews. Belloc's legacy is mixed. His social and economic views were predecessors to the "third way" ideas that would emerge briefly after the collapse of the Soviet Union, although they quickly fell out of favor as there proved to be no workable solutions that were not essentially capitalist. His religious views are now out of favor as are his anti-Semitic views. ↑ Sir John Simon who was a contemporary at Oxford, described his "…resonant, deep pitched voice…" as making an "…unforgettable impression". ↑ Francis West. Gilbert Murray, A Life. (London, UK: Palgrave Macmillan, 1984. ISBN 978-0312327200), 107, describes Murray's impression on an occasion in 1899: In July […] [Murray] attended a meeting on the principles of Liberalism, at which Hilaire Belloc spoke brilliantly although Murray could not afterwards remember a word that he had said. Are all the Human Frame Requires…"
↑ Raymond Williams. Culture and Society 1780-1950. (New York: Columbia University Press, 1983. ISBN 0231022875), 186: Belloc's argument is that capitalism as a system is breaking down, and that this is to be welcomed. A society in which a minority owns and controls the means of production, while the majority are reduced to proletarian status, is not only wrong but unstable. Belloc sees it breaking down in two ways—on the one hand into State action for welfare (which pure capitalism cannot embody); on the other hand into monopoly and the restraint of trade. There are only two alternatives to this system: socialism, which Belloc calls collectivism; and the redistribution of property on a significant scale, which Belloc calls distributivism. ↑ Pope Leo XIII, 1891,Rerum Novarum (Rights and Duties of Capital and Labor), vaticanlibrary. Retrieved January 7, 2009. ↑ Pope Pius XI, 1931, Quadragesimo Anno (On the Reconstruction of the Social Order), vaticanlibrary. Retrieved January 7, 2009..
↑ G. K. Chesterton. The Uses of Diversity a Book of Essays. (1921) (reprint Kessinger Publishing, 2005. ISBN 141790755X). ↑ Hilaire Belloc, The Servile State, 1913). ↑ There is an enormous book called volume 1 of A Cambridge History of the Middle Ages. It is 759 pages in length of close print …. It does not mention the Mass once. That is as though you were to write a history of the Jewish dispersion without mentioning the synagogue or of the British empire without mentioning the city of London or the Navy (Letters from Hilaire Belloc, Hollis and Carter, 75). ↑ Our fathers all but re-established the spiritual mastery of Europe over the East; all but recovered the patrimony of Rome (…). Western warriors, two thousand miles and more from home, have struck root and might feel they have permanently grasped the vital belt of the Orient. All seaboard Syria was theirs and nearly [emphasis in the original] the whole of that "bridge," a narrow band pressed in between the desert and the sea, the all-important central link joining the Moslem East to the Moslem West (…). Should the link be broken for good by Christian mastery of Syria, all Islam was cut in two and would bleed to death of the wound. ↑ The story must not be neglected by any modern, who may think in error that the East has finally fallen before the West, that Islam is now enslaved - to our political and economic power at any rate if not to our philosophy. It is not so. Islam essentially survives, and Islam would not have survived had the Crusade made good its hold upon the essential point of Damascus. Islam survives. Its religion is intact; therefore its material strength may return. Our religion is in peril, and who can be confident in the continued skill, let alone the continued obedience, of those who make and work our machines? (…) There is with us a complete chaos in religious doctrine (…). We worship ourselves, we worship the nation; or we worship (some few of us) a particular economic arrangement believed to be the satisfaction of social justice (…). Islam has not suffered this spiritual decline; and in the contrast between [our religious chaos and] the religious certitudes still strong throughout the Mohammedan world lies our peril. ↑ For Belloc, the common ground includes: the unity and the omnipotence of God; the personal nature, the all-goodness, the timelessness, and the providence of God; His creative power as the origin of all things, and His sustenance of all things by His power alone; the world of good spirits and angels and of evil spirits in war against God, with a chief evil spirit; the immortality of the soul and its responsibility for actions in this life, coupled with the doctrine of reward and punishment after death; the Day of Judgment with Christ as Judge; the Lady Miriam [Mary] as the first among womenkind. ↑ I, for my part, pretend to no certain conclusion in the matter…. Of my own intimate acquaintance who were on the spot [at Dreyfus' trial] and competent to judge, most were for the innocence of Dreyfus: but the rest, fully competent also, were and are, convinced of his guilt…. There are in England to-day two Englishmen whose wide knowledge of Europe and especially of Paris, and the French tongue and society, enable them to judge. They are both close friends of mine. One is for, the other against…. I believe that, when the passions have died down, the Dreyfus case will remain for history very much what the Diamond Necklace has remained, or the Tichborne case; that is, there will be a popular legend, intellectually worth nothing; and, for the historian, the task of criticizing that legend, but hardly of solving the problem. ↑ A. N. Wilson's biography expresses the opinion that Belloc had a tendency to allude to Jews in conversation, in a seemingly obsessive fashion on occasion. Anthony Powell's review of that biography contains Powell's opinion, that Belloc was thoroughly anti-Semitic, except at a personal level. ↑ Dennis Barton, in his "In Defence of Hilaire Belloc" online, churchhistory.org. Retrieved January 7, 2009. Belloc Lowndes, Marie. The Young Hilaire Belloc, Some Records of Youth and Middle Age. New York: Kennedy, 1956. OCLC 221577077. Boyle, David, "Hilaire Belloc and the Liberal revival: Distributism - an alternative Liberal tradition?" Journal of Liberal History 40 (Autumn 2003) ISSN 1479-9642. Chesterton, G. K. The Uses of Diversity a Book of Essays. (1921) (reprint Kessinger Publishing, 2005. ISBN 141790755X. Cooney, Anthony. Hilaire Belloc: 1870-1953. London: Third Way Publications, 1997. ISBN 0953507734. Corrin, Jay P. G. K. Chesterton & Hilaire Belloc: The Battle Against Modernity. Ohio University Press, 1991. ISBN 9780821406045. Haynes, Renee. Hilaire Belloc. Burnt Mill, Harlow, Essex: Published for the British Council by Longman Group, (1953) 1977. ISBN 9780582010352. McCarthy, John P. Hilaire Belloc: Edwardian Radical. Indianapolis: Liberty Press, 1978. ISBN 9780913966440. Pearce, Joseph. Old Thunder: A Life of Hilaire Belloc. San Francisco: Ignatius Press, 2002. ISBN 9780898709421. Rich, Tim, "On a Monkey's Birthday: Belloc and Sussex" contained within Common Ground: Around Britain in Thirty Writers. London, UK: Cyan Books, 2006. ISBN 1904879934. Speaight, Robert. The Life of Hilaire Belloc. New York: Farrar, Straus & Cudahy, 1957. ISBN 9780836980509. Williams, Raymond. Culture and Society 1780-1950. New York: Columbia University Press, 1983. ISBN 0231022875. Wilson, A. N. Hilaire Belloc. (1984) reprint Gibson Square Books, 2004. ISBN 1903933323. This page was last modified on 24 December 2017, at 20:22.